Velvety, earthy, and gourmand all at the same time, this fragrance retains its integrity by being 100% organic. 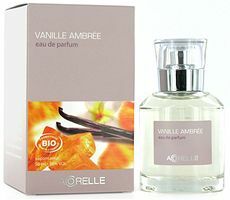 * With feminine top notes of mimosa flowers, distinctive heart notes of almond, patchouli, and vanilla, and base notes of Peruvian balsam, Vanille Ambrée stands out from other fragrances of the same olfactory family. Recalling buttery caramel, powdery amaretto, and a faint hint of mossy woods, Vanille Ambrée has both seductive and energizing properties. This is a captivating, dynamic perfume, and is not to be missed. *Update: correction from Acorelle ~ it's 100% natural but only 92% organic. Okay – I try to take ad copy for what it is, but something about this one really raised my hackles. Probably all the business about maintaining its integrity by using organics. Organic does not bother me either and it does not look like they are capitalizing on it. $68 for a 50ml bottle is actually very reasonable. There are some Organic perfume lines out there that DO capitalize on being organic, their prices definitely show it. For me as i have tried several, as long as their fragrances do not smell medicinal i am fine with trying their line. Organic, Not Organic….truly i do not care as long as they smell good. Organic is definitely not a selling point for me. Agree — they’re very reasonably priced in comparison to most natural/organic brands. “Organic” just ticks me off, too. I think it’s the smug, greener-than-thou attitude that makes me want to be as far away from Acorelle as possible. You guys are cracking me up! Do you hate organic chicken & veggies too? No! I love organic food because it usually tastes better! I just hate it when people get all smarmy about it. I don’t buy organics, I just scrub everything. (It’s rare for us to get sick, although we do have our bouts with the usual childhood viruses and whatnot.) It does annoy me that “organic” seems to imply that “nonorganic” is automatically bad, instead of the crapshoot that “organic” is as well. Especially when referring to a product that you’re not even going to ingest. Stepping down now. And if you want more information (most of it gathered from our state land-grant university), please email me. And if I have offended, please forgive. This is obviously a hot-button issue for me, sorry. I’ll stop now. You havent’ offended at all! And yes, I know organic meat production is sometimes worse than “regular”, etc. Still, prefer to buy organic meat and dairy products when I can. But as I said, have no particular interest in where my perfume comes from. LOL…yeah, I don’t want morality from my perfume either. I love vanilla-y ambery things (I know, I know, but hey, this time of year loves me), but the copy leaves me cold, too. Hey, nothing wrong with that! This is just the time of year when I love Ambra del Nepal. Another vote for Fragrance Without Integrity! As it turns out, most things that are “all natural” have the highest concentration of things that I am allergic to. 100% organic is not a selling point for me. Well gosh. Where is the green lobby around here? I have to admit I don’t much care either way, and I certainly won’t pay more for organic perfume even though I certainly will for organic food, but it doesn’t strike me as a negative. I’m all for organic in most everything. I think it was the snobbery that got me, the whole “maintains its integrity” thing, as if they’re above everyone else. Maybe I’m just reading too much into it. Still, I really am allergic to most of the “all-natural” scents. Is it just me or is the packaging looking a bit IKEA-ish? Ikea has scented candles (sorry IKEA but they stink!!) that have the exact same look to them. And about the organic…. my guess is that it’s useless as it would still likely be toxic to ingest. Besides if all the flower extract used so far had pesticide in it, would’t the pesticite have contributed to the specific smell of those flower absolute? I didn’t know Ikea had their own scented candles…and sorry to hear they stink! On the smell, no idea.